جیسون آیزکس (اینگیلیسجه: Jason Isaacs) بریتانیالی اوْیونچو. ۶ ژوئن ۱۹۶۳ ‏ ایلینده دۆنیایا گؤز آچیب. 1988–گۆنوموز ایللر آراسیندا سینما ساحه‌سینده چالیشیب. Rio, I Love You O "Gringo" Guillermo Arriaga Segment: "Texas"
1992 Taggart Eric and John Barr Episode: "Double Exposure"
1992 Inspector Morse Dr. Desmond Collier Episode: "Cherubim and Seraphim"
1993 Highlander: The Series Immortal Zachary Blaine Episode: "The Lady and the Tiger"
2008 Entourage Fredrick Line Episode: "No.5.7 Gotta Look Up to Get Down"
2018 Robot Chicken Alliser Thorne / Slenderman / Slinky Voice; episode: "Gimme That Chocolate Milk"
↑ What's New on Digital, DVD/Blu-ray, TV, & Netflix This Week: October 8–14 (en). ↑ Travis, Ben (January 18, 2018). Star Wars The Last Jedi and Thor Ragnarok Lead Empire Awards 2018 Nominations. یوْخلانیلیبJanuary 18, 2018. ↑ 'Black Panther' Tops 44th Saturn Awards With Five; 'Blade Runner 2049' , 'Shape Of Water', 'Get Out' Also Score (27 June 2018). یوْخلانیلیب28 June 2018. ↑ Napoleon: Total War – Story Trailer. TotalWar.com. آرشیولنیب اصلی نۆسخه‌دن on 6 April 2012. ↑ Theatre 1953 Almeida Theatre, London. یوْخلانیلیب8 August 2018. ↑ Wolf, Matt (24 April 2000). The Force of Change. یوْخلانیلیب8 August 2018. 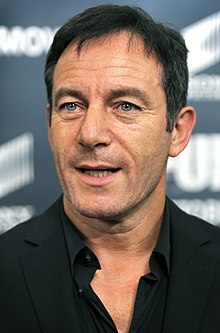 اینگیلیسجه ویکی‌پدیاسی‌نین ایشلدنلری طرفیندن یارانمیش«Jason Isaacs»، مقاله‌سیندن گؤتورولوبدور. ( ۲۲ ژانویه ۲۰۱۸ تاریخینده یوْخلانیلیبدیر). قارداش پروژه‌لرده جیسون آیزکس گؤره داها آرتیق بیلگی‌لر تاپابیلرسینیز.